Wearable technology, clothing and accessories that incorporate advanced computer and electronic technologies, is on the rise. The continuous price-drop of manufacturing resources including body sensors, RFID tags, and microcontrollers, along with an increasing fascination with advanced technology, is accelerating this process. What kind of wearable technology will arise when people are engrossed in sustaining their positive emotional conditions? 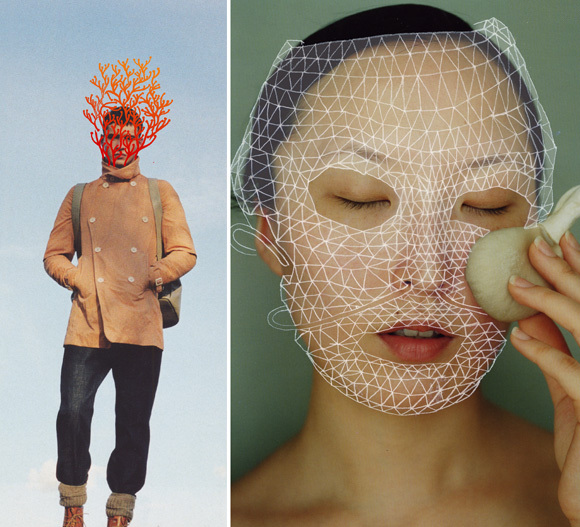 Below are sketches of two wearable technologies, Emotional Vision and MashUP Mask. Besides visualizing these concepts, I wrote a fictional story and shot a portion of this story as a movie to aid imagination. This was a bionic lens built with small circuits and LEDs functioning as a small browser. The Emotional Vision was in a way a visual version of the noise reduction headphone. It filtered out any objects, people, and situations that triggered negative emotions in the user. Frowning, tired, angry, and sad faces; unhygienic, ugly objects; growling complaints, swearing, negative predictions and any other hard-to-define noises were frequently selected as stimulus to be altered. Depending on users' choices, the selected stimulus were blurred, removed or replaced with other pleasant things. Emotions are contagious. People become distressed when they are surrounded by distressed people, and vice versa. Sigal G. Barsade, a psychologist said that unpleasant emotions are more likely to lead to mood contagion than positive emotions. The use of safe vision was welcomed by people who wanted to protect and sustain their positive emotions. Although they acknowledged that wearing safe vision was not the idealistic way to induce and sustain their pleasant emotions, they thought that it was still better than completely removing oneself from the negative situations. Some people even thought that wearing safe vision was an active action one can take to engage with a broader range of people without sacrificing their happiness and segregating negative people. Among the advocates of the use of safe vision, there were some interesting social groups. The first was a group of people who were involved in occupations that required direct contact with customers and who had to display and maintain positive representations through their facial expressions and gestures. They said everybody should wear this safe vision so that they could be freed from the emotional exhaustion and emotional dissonance between their internal feelings and the ones they project to the public. The more interesting, and secret supporters, was the U.S. government and private organizations. They supported Safe Vision in order to stop the spread of collective fear or anger, which could encourage mobs or aggravate the decrease of consumption during recession. 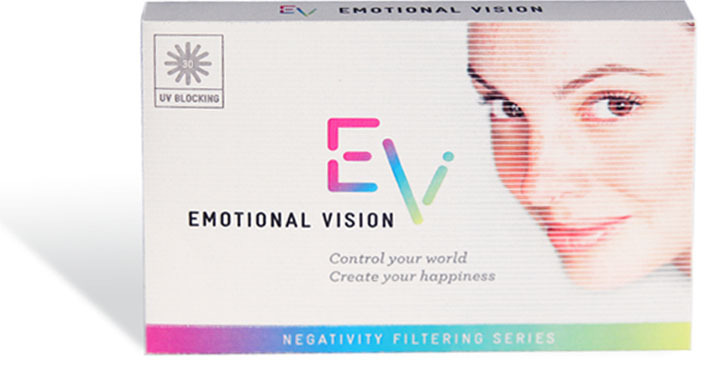 The popularity of Emotional Vision withered away as more and more side effects were revealed and it was completely banned in 2018. The deepened isolation among people and with oneself was one of the most reported side effects. This symptom is well described by a woman who wore Safe Vision for 5 years. Besides this deepened sense of isolation, another side effect was the numbness to the positive stimulus. When the world was filled with only positive things, what was reduced was not only the chance to feel negative, but also the magnitude of pleasure when we encounter pleasant things. The kind of things that used to elicit almost an automatic positive response from people, such as a baby's smile, bright sunshine and harmonious music were not as effective as before. People relentlessly sought for stimulus that brought about stronger positive emotions. Some people even artificially afflicted pain on themselves in order to feel relieved at its cessation. The most dangerous side effect was inherited in the benefit of Emotion Vision - not recognizing negative things. Perceiving negative things, including dangers and harms, is important for our survival. Although the scientist who invented this Emotional Vision was aware of this and limited the range of things that this lens filtered, computer experts who were curious about the full capacity of this new invention hacked the system and expanded the range. A few people who used this altered version of Safe Vision died because they could not avoid dangerous situations such as rushing cars, the threat of street robbers and warning signs. This is an electronics-embedded headpiece designed for people who want to induce and maintain their positive emotional condition as long as possible. 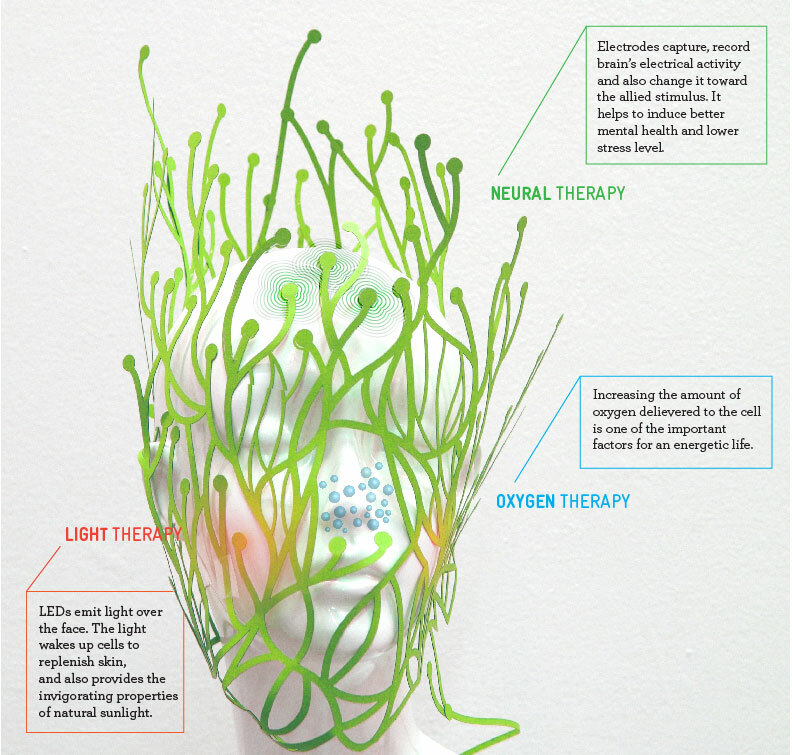 By combining neural, light, and oxygen therapy, this headpiece provides an optimal micro individual space to protect one's emotion from unexpected or unwanted negative inputs from the outside world. The embedded electrodes collect your neural data containing your emotional patterns and transfer it via Bluetooth to a computer, or wirelessly transferred to iPhone or Android devices.